The wide-release, low-budget, horror scene of the last decade has been driven by a single studio…Blumhouse. Jason Blum and his company has done more for horror then any other single studio that I can think of, at least any other studio dealing exclusively in horror…certainly Dimension is up there as well. Under that Blumhouse banner there have been three heavyweights, the Jason, Freddy, and Michael Myers of the 2010’s, with The Conjuring, Sinister and, of course, Insidious. 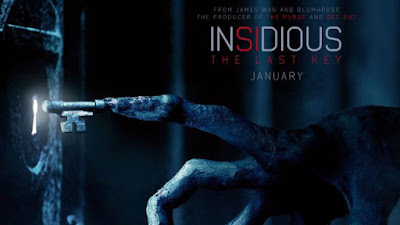 Insidious: The Last Key, the fourth entry in the spirit-centric series, is a prequel of sorts bridging the gap between the last movie…which was also a prequel, and the first movie in the series. Following Elise (Lin Shaye), who started the series in a secondary role as the token parapsychologist, has slowly become the protagonist of the series. She and the rest of the Spectral Sightings crew, Specs and Tucker…the series R2 and C3PO, investigate a disturbance in New Mexico in her childhood home. This is no ordinary childhood home, in flashback we see it’s full on 50’s creep fest. Sitting just a stone’s through away from the penitentiary where Elise’s abusive alcoholic father worked, the home featured such amenities as lights that would flicker when a prisoner was being executed with electrocution, total Norman Rockwell. It got so bad that Elise was forced to run away and abandon her brother, never to come back until she is brought in to investigate the supernatural shenanigans going on. The Insidious series started out with a unique take on the ghost world and the whole “ghost hunter” thing. Prior to the series it was always something that was shown on screen by having a medium close their eyes, flickering some lights and speaking ominously, Poltergeist being the template for all of those to come after it. When Insidious first hit it was, for lack of a better term, groundbreaking. This shadow world, a mirror dimension, where all manner of ghostly horrors lived. The problem is they didn’t continue the innovation or even build on it. Insidious: The Last Key follows the same road, I get it…they’re going to the same place so why would it be different. Because we need it to be that’s why. The thing about horror is the draw lies in the surprise, it’s the main reason sequels are inferior, the surprise is gone, we are just given flourishes on the original concept. Had there been some effort given to a new ghost dimension experience I would be able to watch a new one of these flicks every year but as it stands it seems they’ve run out of steam, or at least new ideas. That may seem like a small gripe but it’s honestly such a big part of the draw of these movies it becomes paramount, when you take the atmospheric and claustrophobic terror away you are just left with another demon-based jump scare flick. While I’m sure they have their fans, I also just can’t get onboard with Leigh Wannell and Angus Sampson’s Specs and Tucker, Elise’s crew and the film’s obvious comic relief. I just don’t think the movie needs it, there’s a chance for it to be a real dour, dark, and terrifying experience…which, honestly doesn’t sound like much fun, but trust me the flick would benefit for those looking for a true horror experience. The film does have it’s shining points, Lin Shaye is the most obvious. While I’ll never be able to see her without thinking of her role as Roy Munson’s landlady in Kingpin, she’s managed to become the elder stateswoman of scream queens in the past 1o years. She brings a level of talent and performance to the role that simply isn’t expected so it’s always a pleasant surprise. The filmmakers also brought in some real-world horror to make things more uncomfortable in the form of Elise’s abusive childhood. The creature design is also a high point. 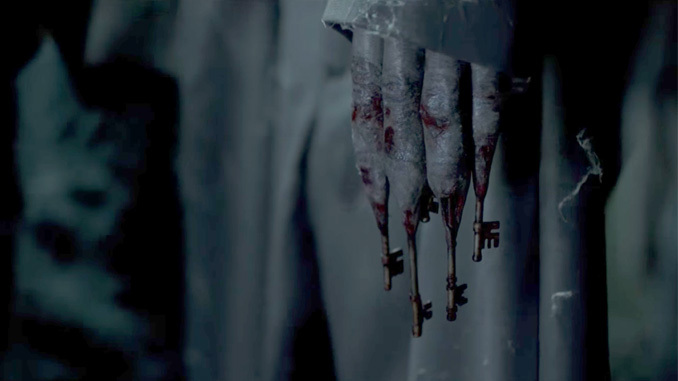 The film’s primary demon, a creature with keys for fingers that can lock the scream in your very throat and use those keys to open the door between worlds, is unsettling. This is an area that Insidious and really Blumhouse overall, has always excelled at and I was happy to see that they continue to innovate and deliver fresh monsters when it’s so easy to fall down that generic baddie pot hole. Lastly, what would be a negative for some, I’m putting in the positive list…the jump scares. Now I love horror movies, but I’m not one of those guys that’s going to tell you I don’t still get scared. I may not, generally speaking, get that lasting, up at 2am looking at the slightly open closet door with terror, type of fear, but a good jump scare will get me everytime. I’m always surprised when film’s can catch me off guard, Insidious: The Last Key caught me at least 4 separate times. Not the best of the franchise by any means Insidious: The Last Key is a fun watch packed with quite a few thrills and a hell of a lead actress. 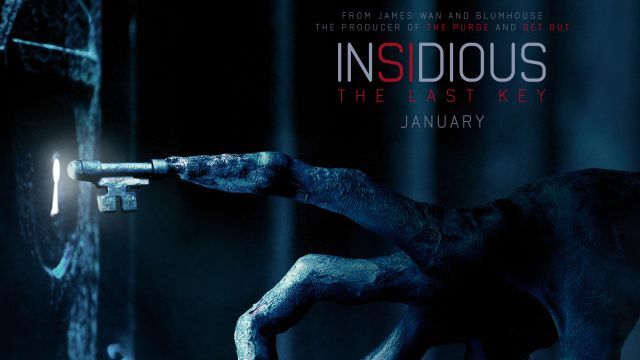 Here in the doldrums of January cinema Insidious is a flick that is worth it’s ticket price if your looking for a few hours to turn your brain off and spark some of that fight or flight adrenaline. I think it goes without saying but if you haven’t been a fan before, this one’s not going to change your mind. It’s not for everyone but if you saw the trailers and thought it was something you might like, you wont be disappointed.